Tammy Manning pours water over her granddaughter's hands to wash them before dinner on Sunday, March 11th, 2012. Despite several families claiming their water has been contaminated due to fracking, much of the town is still in favor of drilling for natural gas. Individuals who lease out land to the gas companies to drill can make anywhere from hundreds to hundreds of thousands of dollars. Tammy and Matt Manning were excited to own a house for the first time when they moved to Franklin Forks, Pennsylvania in November 2010. 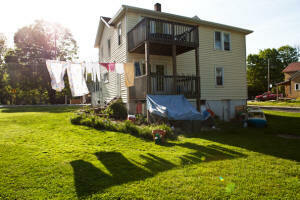 Their two daughters, three grandchildren and Tammy's father also moved in with them. Shortly after the Mannings moved into their home, WPX Energy began drilling for natural gas in their area. One day, their water came out of their faucet grey, not even a year after they became homeowners. Their water was tested positive for high, unsafe levels of arsenic, barium, methane and other dangerous chemicals. Tammy and Matt are convinced this is a result of hydrofracking, a controversial process used to extract natural gas from deep in the ground. The family could no longer drink or cook with the water and showering in it was a very high risk, although they had no other choice. Once a week Matt would drive across the New York State border to his mother's house to fill gallon jugs with her tap water, which the family depended on for safe water. High levels of methane filled the air in the house – so much so that they had to stop using their gas stove for risk of explosion and shower with the window open, even in the winter, so that they wouldn't pass out. They lived like this for months before WPX Energy began delivering water to them once a day. Although they still can't drink the water, it is safe to cook and shower with. WPX still doesn't admit to contaminating their water, but say they are just being good neighbors. Despite the family's situation, most of the community is in favor of fracking, due to the large amount of jobs and money the industry brings to the small community. The town holds public town meetings, where the Mannings are not welcome. They have been verbally harassed in public and tailgated to work by gas workers. The Mannings are currently fighting to end fracking nationwide and to get WPX Energy to take responsibility for the contamination of their water. Read on for heartbreaking images of their daily life. The Manning family bought their first home in the town of Franklin Forks, Pennsylvania in November 2010. A glass of water from the sink sits on the counter of the Mannings' house on Saturday, February 4th, 2012. 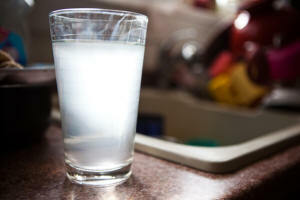 Their water has tested positive for unsafe levels of arsenic, barium, methane and other chemicals. Matt Manning plays by the creek behind his house with his grandchildren in Franklin Forks, Pennsylvania on Sunday, March 11th, 2012. Since then, the creek has began to bubble with methane, and Matt will no longer let his grandkids go swimming. Jayden McNeilly, 3, plays with his "Scuba Scooby" toy in a bag of water from his house in Franklin Forks, Pennsylvania on Friday, March 9th, 2012. Jayden's family's water tested positive for high amounts of arsenic, barium, methane and other contaminants shortly after the beginning of fracking in their town. Tammy Manning glances at her husband while cooking dinner for her family on Friday, March 9th, 2012. Because of a very high level of methane in their home due to fracking, Tammy has to cook on an electric stove. If she uses the gas stove, there is a risk of an explosion. 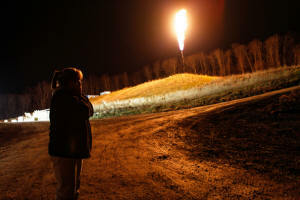 Tammy Manning plugs her ears as she stands in front of a flaring gas well on Friday, November 30th, 2012. Flaring, which burns off extra gas from the well, burns for two weeks and sounds like a jet engine. Over the past year, Tammy has watched her town transform since the introduction of fracking. 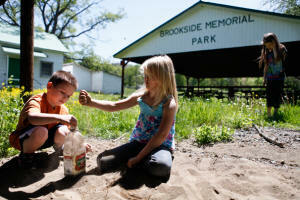 Jayden and Madison play with their neighbor in a park close to their home in Franklin Forks, Pennsylvania on Saturday, May 12th, 2012. 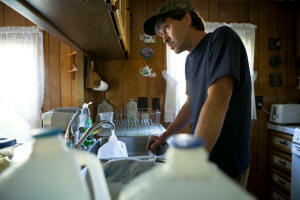 Their families are two of three in the town who claim that their water has been contaminated due to fracking. 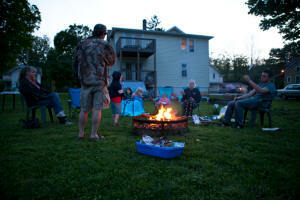 The Manning family roasts marshmallows around a campfire behind their house as the sun goes down on Saturday, May 12th, 2012. During the summer, the family loves to spend time outside. 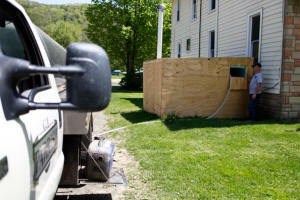 Matt Manning drives to his mother's house in New York to fill up jugs of water for his family to use for drinking water. Instead of buying water, the Mannings prefer to travel 20 minutes across the border once a week to get water. Matt Manning listens to his mother talk as he fills up a jug with water at her house in New York on Sunday, May 13th, 2012. He drives here once a week to fill jugs so that his family can have clean water to drink. 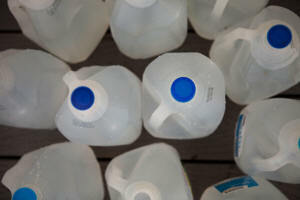 Jugs of tap water from Matt Manning's mother's house sit on her front porch as he fills up the rest inside. Months after the introduction of fracking to Franklin Forks, Pennsylvania, the creek behind the Mannings' house began to bubble with methane. 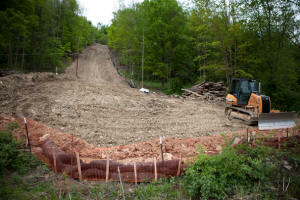 A section of woods is cut down so that WPX Energy can build a pipeline for natural gas in Franklin Forks, Pennsylvania. Although fracking has changed the landscape and contaminated the water of several familes in Franklin Forks, the majority of the town is in favor of gas drilling because of the jobs and money it can bring to the town. A worker from Stone & Parrish, a farm equipment repair company, fills up a tank with water at the Mannings' house on Sunday, May 13th, 2012. WPX Energy pays for water deliveries to the Manning family and two others, although they still don't take responsibility for contaminating their water. 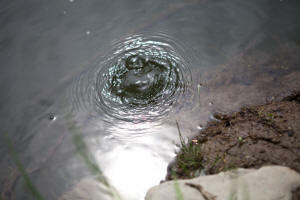 The water is safe to cook and bathe in, but is still not safe to drink. 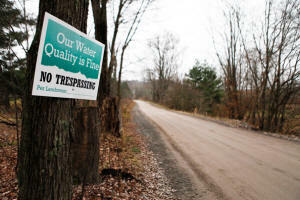 Signs are scattered throughout Franklin Forks, Pennsylvania reading, "Our Water Quality is Fine." Despite several families claiming their water has been contaminated due to fracking, the majority of the town continues to support drilling for natural gas because of the jobs and money it can bring into the town.